Here's a list of some of the coolest resources we've come across for teaching ESL. Québec Reading Connection provides information about an extensive selection of quality literature from Quebec, Canada and beyond. Their goal is to further the development of language learning, cultural awareness and the love of reading in children and young people. Chosen through a rigorous selection process, the titles are intended for young people in preschool, elementary and secondary school. Their extensive database offers classroom suggestions and pertinent connections to the Québec Education Program. Educator.com is a website that provides math and science courses for the high school and university levels. You can also access free and paid lectures. Do you suspect that your students have copied something online? Is it plagarism? Fabulous way to poll students! This interactive platform allows students to participate in a poll generated by the teacher using the CELLPHONES! You'll need to register, but it's free to use. This is yet another cool way to integrate technology into the classroom. Plickers only requires one cellphone or tablet. The teacher can scan the classroom and register the votes of all students. Statistics are then displayed. This platform is sure to motivate students and get them involved in their learning. 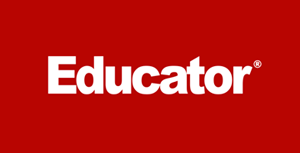 The Teaching Channel has a wide selection of professional development videos for teachers. See what's happening in classrooms across the U.S. It is where teachers come to learn from each other. Poll Everywhere is a great tool that allows your students to use their cellular phones in class! Create an online poll and survey your students. The students use their phones to participate and text their answers to the website. Results are compiled and appear in real time directly on your Activboard. It's the same as ActivVote. Quizlet is a must for building vobulary. Who would have known how cool learning with flashcards could be? This site allows you to build your own set of flashcards from your list of vocabulary words, or use someone else’s. Type in the title of the novel you are studying, I’m sure more than one list already exists. I tried with the novel The Outsiders. From your list, your students can study, play games and even take tests that are created automatically. It’s a truly amazing site used by teachers worlwide. Wow! I just came across this incredible site for writing. They actually have a long list of writing topics for each level, along with a student model text. This is fantastic if you want to give examples to your students. This site also has a section for 5 minute mini-lessons to teach your students how to improve their writing - this is perfect for teachers like me who are using a writer's workshop approach. Create the most amazing lessons using this FREE presentation platform. Easier to use than Prezi and more attractive than Powerpoint, PowToon combines presentation and animation. Your students will love your PowToon courses - GARANTEED! Puzzlemaker is exactly what it’s name says. It takes your list of vocabulary words and transforms them into crossword puzzles. Puzzlemaker is a puzzle generation tool for teachers, students and parents. Create and print customized word search, criss-cross, math puzzles, and more-using your own word lists. IDEA stands for Internation Dialects of English Archive. Here you can click anywhere on an interactive map of the world to hear all the different accents on recordings. The site was first created for actors to hear real-life models for their characters’ accents and dialects. Today, it can be used to expose your students to the use of the English language around the world. Class Dojo is a great classroom management program. For those of you who manage your classroom with a point and reward system, this platform makes it so much easier. You can even involve the parents and provide them with updates on behavior, participation and work. Get your students blogging! A blog is a great way to get kids writing and giving feedback to their peers on their writing. The day of exchanging papers and writing comments at the bottom in different colour ink is over! It's easy and fun! You can enter entire groups giving each student their separate account. Best of all, Kidblog is a safe environment and it's free! Of course, there are upgrades that you may want to pay for later on, but the basic package is enough to get you going. Go to http://kidblog.org/home/ to get started today! The Hot Potatoes suite includes six applications, enabling you to create interactive multiple-choice, short-answer, jumbled-sentence, crossword, matching/ordering and gap-fill exercises for the World Wide Web. Hot Potatoes is freeware, and you may use it for any purpose or project you like. Great selection of short films at Stark Productions in the video samples section from my personal friend Paul Stark, film producer in Toronto, Ontario. Primary teachers will want to purchase the 9 episode S.M.A.R.T. Tips series for your classroom. They are videos made in collaboration with the Timmins Police service of Ontario for schools. Created for teachers by teachers, Promethean Planet is a unique teaching, sharing and support community—your place to connect, create and change the classroom. If you have an active board in your classroom, you can subscribe to this website and receive notices of new material put online. Get access to all of CBC television’s great programming anywhere, anytime with CURIO. You’ll also have access to the French Radio-Canada. By subscribing, you will also have the rights to show any program in your classroom. Ask your school to subscribe. Great 5-minute drawing and following instructions activity to calm students down when they enter the classroom. Artist, Nick Krakosky, gives some basic drawing lessons. Students must follow the instructions and try to reproduce the same drawings ranging from a Leprechaun (my favourite at St-Patty’s Day, to a Pilgrim (on Thanksgiving), to an Italian Gangster. Stop the video when necessary. Instructional videos on how to do just about anything. Prezii a new and innovative way to make presentations. It’s software is totally free to use; however, you can also purchase an upgraded version of Prezi. No one is using PowerPoint anymore… they’re using Prezi! Hott Notes is the coolest thing! Put post-it, sticky notes on your computer to remind you of deadlines, appointments, meetings, etc. This is a great organisational tool for the busy teacher. This site has all kinds of stuff that make teaching easier: enter your class list, and this program will generate a seating chart for you. You can shuffle students as often as you like to create new seating charts. This website can also form groups for you: simply choose how many students you’d like in each group (2, 3, 4…) and the rest is done randomly. There are other super tools for you to discover. Record your students using Audacity. It’s the best way to create MP3, Wave or any other type of file that you can save to your computer or burn to a CD. You can even record several layers of tracks. They can even create their own Podcasts. Merriam-Webster’s Learner’s Dictionary is the online dictionary made for second language learner’s. It is the perfect tool for the second language learner. Have your students use this dictionary. It is filled with clear, conscise definitions as well as many examples of the word used in context, this is what truly makes it the best. Have your students respond to your survey, our even create their own using this great tool! This is a great site with lots of video information for English learners from how to become better in English class, to identifying parts of speech, how to write a literary commentary. Short Story Unit from the Calgary Academy is a great interactive way to teach and learn the elements of the short story such as: theme, conflict, setting. There are also interactive short stories to read with activties to complete. Note: This website may reqiuire you to register.